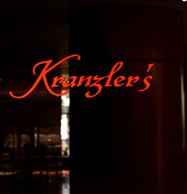 Kranzler's Restaurant & Bar at the Kempinski Hotel Beijing Lufthansa Center is new, hip, trendy, and has a fabulous buffet as well as an a la carte menu. The restaurant features a spacious contemporary ambience with walls of windows that provide lots of natural light and views of the Kempinski Hotel Beijing Lufthansa Center gardens, and interesting art glass panels with red and white "broken glass" designs throughout the restaurant. 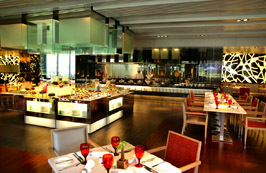 There are high long tables with stools where guests can meet to enjoy a cocktail with friends, as well as wood chairs upholstered with white and red cushions flank wood tables accessorized with red glasses and miniature bamboo plants. 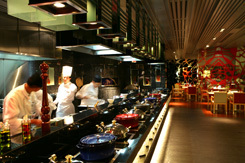 However, the main feature of the restaurant is the large open kitchen where Executive Chef Wolfgang Schmelcher likes to "play," and guests can watch the chefs in action. Edward F. Nesta and I had lunch at Kranzler's Restaurant & Bar in October 2006, and although the restaurant offers a very interesting a la carte menu, when we saw the tempting hot buffet counter long enough to land a plane on, our choice was very easy; we selected to have the buffet. The incredible buffet offered us the opportunity to create our own "dim sum" from the tasty steamed buns shaped and painted to look like peaches, shrimp filled steamed wontons, meat filled wontons, chicken, fish, pork, beef, shrimp, and vegetable dishes, soups, and so many savory items that it was hard to narrow down our selections. A few of my favorite items on the hot buffet were the pretty as a peach steamed buns, as well as the grilled vegetables, and the shrimp filled steamed wontons. In the middle of the restaurant, there were several cold food stations, offering a varied assortment of sushi, mixed seafood, many types of fish, calamari, meats, cheeses, marinated vegetables, and a wide selection of salads with every imaginable topping. I really enjoyed sampling my way through the tasty selections of delicious sushi rolls. The perfect finale was a dessert station so laden with gorgeous pastries, miniature tarts, cakes, and puddings, that they could really be a meal in themselves. Why not? Imagine miniature tarts crowned with fresh ripe berries, mile-high cakes with luscious fillings, puddings, mousses, crème brûlees, fudge-like chocolate cakes, and so much more that would tempt anyone off their diet. I heard that eating chocolate is very healthy, so of course, I indulged, along with a few other delectable goodies; I knew that I could go to the rooftop pool later and swim a few laps to work the desserts off, which were definitely worth the calories.